The musicality of tube components is totally enthralling. So, how do you buy into the tubular lifestyle without breaking the bank? To begin you'll need speakers somewhere above 85dB efficient (most are) plus your favorite source components and… a Nighthawk! Available in Deep Grey with Silver trim. The musicality of tube components is totally enthralling. So, how do you buy into the tubular lifestyle without breaking the bank? To begin you'll need speakers somewhere above 85dB efficient (most are) plus your favorite source components and… a Nighthawk! "Enough power to make most speakers sing"
"After several weeks of auditioning the Nighthawk MK2, I can say that it is musical, natural sounding, easy to operate, and has a major “coolness factor” with its array of glowing tubes. With the right speakers, you will never feel you lack power and you just might pull out some music that you shelved because the recordings sounded harsh. Raven Audio has quite a selection of preamps and amplifiers, and the Nighthawk MK2 is reasonably priced for the quality of construction and sound it offers. If you are interested in getting into tubes for the first time, the Nighthawk MK2 is a great choice. The fact that it is self-biasing means you can “set it and forget it”. The Nighthawk MK2 will give your music wings!" The 20wpc Nighthawk Integrated is Raven Audio’s entry-level amplifier, your taste of tubes on a budget. It handles digital and analog with a no compromising wideband, smooth, detailed and accurate sound. 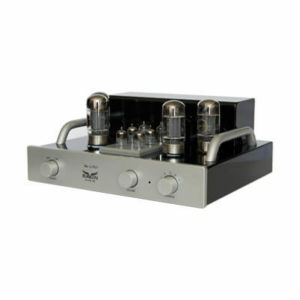 Unlike many tube amplifiers, there is no roll off in the high frequencies or "fog" which negatively affects high-end detail. You will hear everything that is in the recording but, with pure tube glory. Twenty watts per channel may not sound like a lot of power to some but, in terms of driving speakers, it is equivalent to a high quality one hundred watt per channel solid state amplifier. Engineering expertise from our fifty thousand dollar Shamon Mono amplifier has been employed in the Avian Series in several places. This means bass will be articulate and fast! 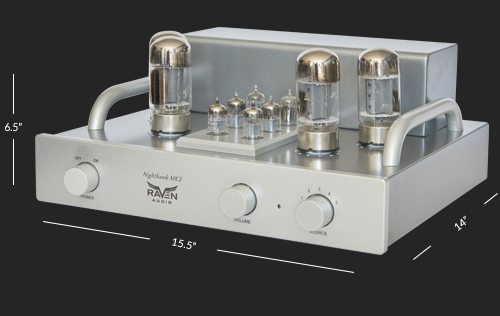 Raven Avian Series Integrated amplifiers are self-biasing; you never have to adjust tubes for a perfect match. Did we mention Raven is American made? This is directly related to our core culture at Rave Audio. Our quality of construction and sound quality standards, mean that we must manufacture in America. We hold our partners to the highest level of quality requirements which means we have to be physically near every part of the manufacturing process. This produces a quality that far surpasses our competitors' overseas endeavors. Because output and power transformers are essential to the Avian series sound, we've designed custom wound transformers for both electrical power and audio output. Our proprietary transformers are built in the U.S.A. to the highest specifications and are crafted to last a lifetime. Best tube amp under $3,000!